Since its first successful use in genome editing of eukaryotic cells [1, 2], CRISPR-Cas9 technology has fascinated many with its promise: the ability to cut and paste nucleotides in the genome with the precision one would expect from the search-and-replace function of a word processing application. It has spawned numerous discussions about whether and how the ability to readily re-write the genome will lead to groundbreaking medical therapies. Nevertheless, CRISPR-Cas9 currently provides a powerful tool to effectively address a critical question in biomedical research: What is the genetic basis of human disease? One of the most exciting applications of CRISPR-Cas9 technology is the generation of novel cellular models to help researchers address this question, and more importantly, understand how a disease phenotype is regulated. By delivering the Cas9 (CRISPR-associated enzyme 9) nuclease with a specific guide RNA (gRNA) sequence into a cell, CRISPR-Cas9 can be used to modify the genome. Cas9 will generate a DNA break at a genomic location complementary to the gRNA sequence and by taking advantage of the naturally-occurring pathways for DNA repair in the cell, can result in changes to the genetic information. While previous methods of genome editing relied on the generation of unique engineered proteins for targeting specificity such as zinc finger nucleases (ZFNs) and transcription activator-like effector nucleases (TALENs), CRISPR-Cas9 instead relies on the gRNA for targeting. Since RNAs are easier, cheaper and faster to produce, this unique property has propelled CRISPR-Cas9 genome editing into widespread use among scientific researchers. This technology is being rapidly incorporated into a wide range of studies due to the ease and efficiency with which CRISPR-Cas9 can edit the genome. Historically, there have been few research options to study and manipulate disease variables in a model that closely matches human physiology. Studying a human disease using animal models is a process of trial and error that can take years and occasionally, an equivalent human disease phenotype simply does not exist in animal models. Furthermore, many animal models are incapable of fully recapitulating human disease and clinical trials often find that therapeutics developed in animal models fall short in humans. Traditional experimentation using human cells often relies on immortalized cell lines that may no longer accurately represent human cellular physiology. The pairing of CRISPR-Cas9 genome editing technology with human pluripotent stem cells has opened up new, improved avenues for modeling human diseases. Human induced pluripotent stem cells (iPSCs) are derived from somatic cells and can propagate indefinitely in vitro. As these cells can be derived from healthy donors and patients alike – they have dramatically expanded the toolkit for researchers studying human diseases. With robust and efficient differentiation protocols, researchers can use iPSCs to generate almost every cell type. The availability of standardized differentiation media, such as the STEMdiff™ family of tools for differentiation, allows for functional in vitro cellular models of disease. Recent advances in 3D organoid cell cultures have taken these disease models a step further by incorporating some of the key features of whole tissues and organs, and hold promise to bridge the gap between in vitro and in vivo research. But what if you want to study a mutation or gene variant for which patient samples are lacking? You could bypass the difficulty of obtaining patient samples by using CRISPR-Cas9 technology to generate specific mutations of interest in human iPSCs, followed by differentiation to the disease-relevant cell type. Not only does this combination of technologies enable the study of diseases lacking in vitro models, it also allows researchers to better study complex diseases, such as autism spectrum disorders (ASD), Alzheimer’s disease (AD) and cancer. Through mutation of a single gene of interest, researchers can begin to elucidate the role of that gene in disease. For example, Deneault et al. generated ten CRISPR-Cas9 edited iPSC lines, each lacking a different ASD-relevant gene, and identified reduced connectivity in neurons differentiated from those edited lines as a common functional phenotype. Application of CRISPR-Cas9 technology in iPSCs enabled the group to generate mutant iPSC lines in the same isogenic (identical genetic background) human control iPSC line, reducing the inherent variability of iPSC lines derived from different donors. CRISPR-Cas9 can also be used to correct patient mutations for basic research or potential therapeutic purposes. A recent study took iPSCs harboring the APOE4 risk variant derived from individuals with sporadic AD and corrected the mutation to the APOE3 variant that is not associated with AD risk . The authors also introduced the APOE4 variant into ‘control’ APOE3-expressing iPSCs and the different isogenic cell lines were differentiated into multiple brain cell types including neurons, astrocytes and microglia. This comprehensive approach identified that conversion of APOE4 to APOE3 in multiple genetic backgrounds was sufficient to attenuate multiple AD-related phenotypes. The examples outlined above demonstrate the power and versatility of CRISPR-Cas9 when combined with human pluripotent stem cells. Introduction of disease-relevant mutations and/or correction of patient mutations can be used as complementary approaches to circumvent the difficulty of obtaining patient samples, as well as challenges in controlling for individual genetic background differences, to reveal mechanistic insights into disease pathogenesis. In one STEMCELL study, a group led by Vincenzo Macri and Adam Hirst genome edited human iPSCs using CRISPR-Cas9 and differentiated the cells into cardiomyocytes to recapitulate a heart rhythm disorder, called long QT syndrome (LQTS) . In LQTS patients, there is a prolongation of the ventricular cardiomyocyte action potential repolarization phase . This can result in electrical instability of the ventricles, leading to an increased risk of arrhythmia and sudden cardiac death. A number of molecular determinants can lead to LQTS type 2 (LTQS2), including mutations in the hERG gene that encodes a potassium ion channel subunit required for repolarization of the ventricular action potential . Heterozygous loss-of-function mutations in this gene lead to abnormal ventricular repolarization and cause approximately 30% of LQTS cases . The researchers used CRISPR-Cas9 in human iPSCs to introduce a heterozygous hERG deletion that caused an early stop codon. The genome-edited human iPSC clones (Figure 1A) were then differentiated into cardiomyocytes using the STEMdiff™ Cardiomyocyte System (Figure 1B) . An electrophysiological assay (Figure 1C) showed that the heterozygous hERG-edited cells exhibited a prolonged field potential duration, delayed beating and subsequent spontaneous rapid beating compared to the isogenic control human iPSC line. These electrical phenotypes are also observed in LQTS2 patients. For the full story on this genome editing experiment, watch the webinar titled Highly Efficient Single-Cell Human Pluripotent Stem Cell Cloning and Robust Cardiomyocyte Differentiation . Figure 1: Modeling long QT syndrome ssing human iPSCs and CRISPR-Cas9. (A) A mutation was introduced into iPSCs using CRISPR-Cas9 to target the hERG gene, and clonal populations were derived using CloneR™. (B) Heterozygous iPSCs were differentiated into cardiomyocytes using the STEMdiff™ Cardiomyocyte System. (C) Electrophysiology graph showing two consecutive cardiomyocyte electrical cycles. Compared to the control cardiomyocytes (black), the field potential duration of the edited cardiomyocytes (red) is prolonged and beating is delayed. How does one set about to generate an in vitro disease model with CRISPR-Cas9 and pluripotent stem cells? Depending on the experimental goal and the genetic basis of the disease of interest, a few approaches should be considered. If the goal is to understand the general role of a gene in disease, a knockout model is a frequently used approach. Alternatively, one can introduce precise DNA changes that incorporate a single nucleotide variant or transgenes into the genome. These two approaches both require a CRISPR-associated endonuclease protein, for example Streptococcus pyogenes Cas9 or SpCas9, and a custom-designed gRNA, which function together to generate a targeted DNA break in the genome that can be repaired by the cell. If you wish to incorporate specific genetic changes, precise (or “knock-in”) editing also requires a donor DNA template to instruct the cell of the type of changes to make during repair of the break. The general mechanism of CRISPR-Cas9 is depicted in Figure 2. The ribonucleoprotein (RNP) complex—composed of Cas9 partnered with a gRNA—scans the DNA for a particular recognition sequence, also known as protospacer adjacent motif (PAM), that lies directly downstream of the gRNA targeting region. Different bacterial species of Cas9 utilize different PAM sequences, however SpCas9 is most commonly used and recognizes a PAM sequence of 5’-NGG-3’. When SpCas9 detects an NGG sequence, it opens up the DNA double helix to evaluate whether the adjacent base-pair sequence is complementary to that of the gRNA. If there is a match, Cas9 generates a DNA break three to four bases upstream of the PAM sequence. Endogenous DNA repair pathways will then take over to repair the break. 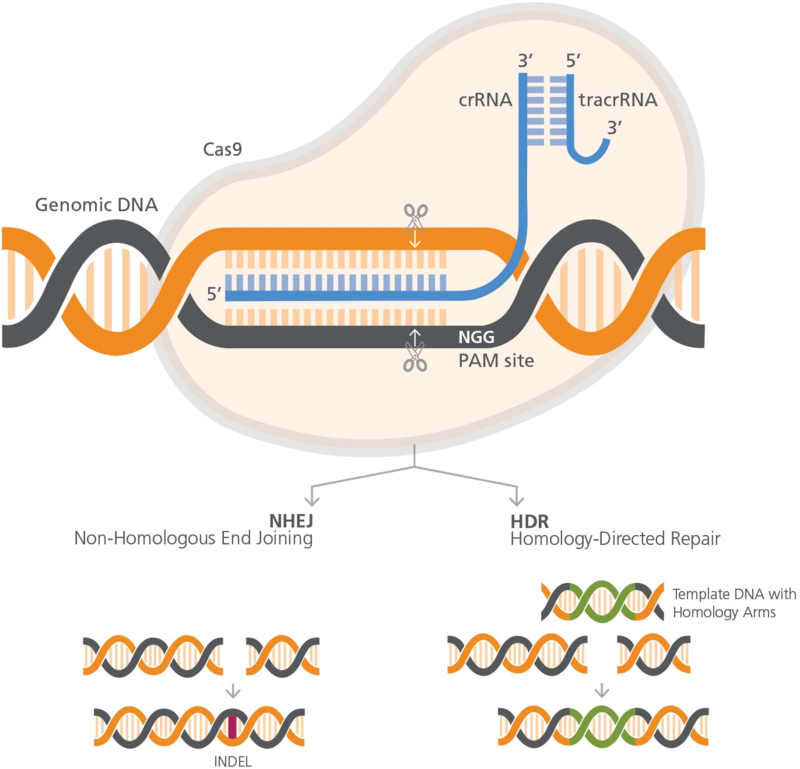 Figure 2: General mechanism of CRISPR-Cas9 genome editing. For more information about designing sequences for a CRISPR-Cas9 experiment, see the Technical bulletin: design considerations for the ArciTect™ CRISPR-Cas9 genome editing system . Knockout (i.e. loss-of-function) mutations are typically generated by taking advantage of an endogenous DNA repair process known as non-homologous end joining (NHEJ). NHEJ repairs DNA breaks through direct ligation of DNA and can result in loss or gain of genetic information (Figure 2). Therefore, after Cas9 generates a targeted DNA break, NHEJ may result in the formation of small insertions or deletions (INDELs) to cause frameshift mutations and lead to truncated and/or non-functional proteins. Targeting exons that encode essential domains of the protein or exons that are common across the majority of transcript isoforms represent common approaches to achieve complete loss-of-function of the protein of interest. If the study requires introduction of a specific mutation, correction of an existing mutation, endogenous tagging of a genomic locus (e.g. to track expression patterns) or introduction of a selectable marker or transgene, then knock-in mutations can be generated by incorporating exogenous donor template DNA into the CRISPR-Cas9 experiment. To aid in targeting, the exogenous DNA contains homology arms—homologous sequences that flank the target site and are complementary to the site of interest. Following Cas9-mediated DNA breakage, this exogenous sequence can be used as a donor template for repair (Figure 2). This type of experimental approach relies on the homology-directed repair (HDR) pathway, which functions to incorporate the exogenous sequence at the cleavage site. This is a particularly powerful approach, as it enables researchers to ‘re-write’ the genome in a very targeted and specific way. Beyond introduction or correction of disease-relevant coding mutations, one can also begin to functionally dissect non-coding disease-associated genetic variants. This is particularly important, as recent studies indicate an enrichment of disease-relevant genome-wide association study (GWAS) hits lie within putative non-coding regulatory regions . Once the experimental goal is defined and the editing approach is chosen, the gRNA targeting sequence for CRISPR-Cas9 can be designed. The gRNA is composed of a CRISPR RNA (crRNA) and a trans-acting CRISPR RNA (tracrRNA); the two sequences may be joined by a linker region to form a single gRNA . The crRNA is necessary for sequence-specific targeting of Cas9 and the tracrRNA acts as a scaffold for the gRNA-Cas9 interaction. As shown in Figure 2, the targeting crRNA is designed to be complementary to the genomic target of interest at a site 5’ to the PAM sequence. To facilitate the crRNA design task, a number of online design tools  can perform sequence analysis of the target locus by identifying potential Cas9 binding sites. Many of these tools also assess the predicted ‘on-target’ activity of the gRNA sequence and weight this score against potential ‘off-target’ activity of the gRNA, in addition to several other parameters. Since editing efficiency is dependent on cut-to-mutation distance, the location of the gRNA-directed Cas9 break should be carefully considered for the generation of precise knock-ins . For more information about crRNA design, see the Technical bulletin: Design considerations for the ArciTect™ CRISPR-Cas9 genome editing system . Almost all human genes have multiple potential crRNA target sequences and different crRNAs show varying editing efficiency [15,16]. Thus, where applicable, it is recommended to design at least three independent crRNAs for the locus of interest, to be tested in parallel. In addition to identification of the gRNA with highest editing efficiency at the site of interest, derivation of distinct gene-edited populations and/or clones using independent gRNAs can help address concerns of off-target effects, as will be discussed later below. Human iPSCs are a very useful source of cells for genome editing purposes. Beyond the fact that they can be derived from the somatic cells of either patients and/or healthy donors, they represent a theoretically unlimited source of edited cells due to their potential for indefinite renewal. A major challenge in effective disease modeling with human iPSCs is the inherent genetic variability that exists between individual donors. While there exists some difficulty in derivation of clonal cell lines, discussed in more detail below, CRISPR-Cas9 genome editing has enabled researchers to generate isogenic clonal human iPSC lines to help circumvent this challenge. To perform CRISPR-Cas9 genome editing in human iPSCs, the first step is to obtain high-quality cells. Human iPSC quality is generally defined by the ability of the cells to differentiate into all three germ layers (i.e. ‘pluripotency’), high expression of undifferentiated state markers such as TRA-1-60, SSEA3, OCT3/4 and karyotypic stability. Morphological assessment of human iPSCs is also a very sensitive indicator of cell quality. Characteristic features of human iPSC cultures include uniform, densely packed colonies that have smooth edges and are free of differentiated regions. Individual iPSCs exhibit large nuclei, prominent nucleoli and a high nucleus to cytoplasm ratio. For more information regarding optimal culture and quality control of human iPSCs, please visit the STEMCELL resource page on iPSC quality control. Next, you have to decide on how you're going to express CRISPR-Cas9 components in the cell; there currently exist a number of ways to accomplish this. Cas9 and gRNA expression systems can come in a variety of formats, including Cas9 mRNA or purified Cas9 protein complexed with in vitro-transcribed (IVT) or synthetic gRNAs, or through encoding Cas9 and gRNA sequences in expression plasmids. Each of these systems has unique benefits and drawbacks. Cas9 and gRNA expression plasmids not only require molecular cloning, the transfection of plasmids into human iPSCs can be inefficient and result in high cytotoxicity. Further, due to the prolonged expression of Cas9 in plasmid-based systems  and the potential for undesired integration of DNA at the cut site , plasmid-based systems are plagued by an increased risk of off-target effects [19, 20]. To address these concerns, some groups have delivered Cas9 mRNA directly into the cell alongside IVT or synthetic gRNA. However, mRNA can be quite unstable and result in low expression ; more recently concerns have also been raised regarding the use of IVT gRNA, as these can trigger an innate immune response [21, 22]. Limitations of the previously described CRISPR-Cas9 expression methods prompted the development of more optimized systems. Currently, the most effective and safest method of expression is direct delivery of CRISPR-Cas9 ribonucleoprotein (RNP) complexes [17, 20]. As illustrated in Figure 3, this relatively simple method does not require cloning or foreign nucleic acids and instead relies on recombinant Cas9 protein complexed with custom synthetic gRNA. Since the RNP is introduced into the cells as an active complex, this method does not require transcription and translation of the components, making it more rapid than previous methods. The CRISPR-Cas9 RNP complex, such as the one used in the ArciTect™ system, is present within the cell only transiently (degraded within 72 hours), resulting in a reduced chance for Cas9 off-target cutting. Figure 3: Genome editing workflow for iPSCs. 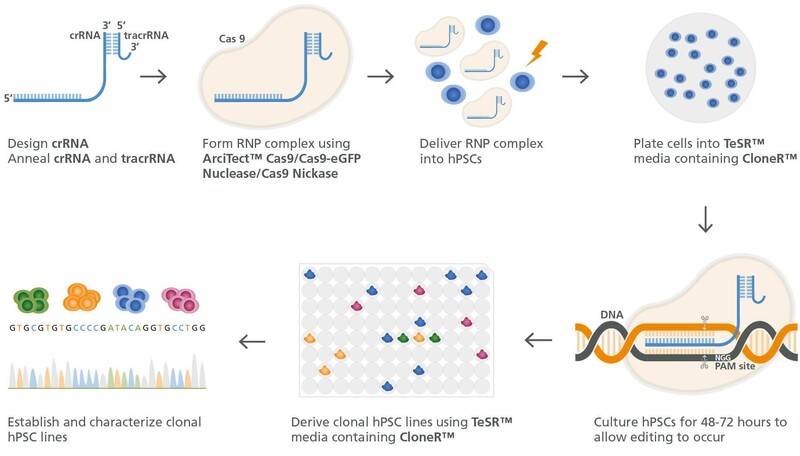 For a detailed step-by-step guide on genome editing of iPSCs using CRISPR-Cas9, see the Technical bulletin: genome editing of human pluripotent stem cells. Editing efficiency is often measured as the proportion of edited versus non-edited or wild type alleles in the post-editing cell population. There are multiple elements that contribute to editing efficiency, including delivery efficiency, strategic gRNA design, Cas9 cutting efficiency, DNA repair pathway choice and survival of edited cells. We will expand on some of these elements below and provide practical tips to maximize experimental success. There are a number of ways to deliver CRISPR-Cas9 components into human iPSCs. Common delivery methods include chemical (i.e. lipid- or polymer-based methods) or physical (i.e. electroporation) transfection of Cas9 and gRNA. However, human iPSCs present a challenge in terms of delivery as there exists a delicate balance between transfection efficiency and cell survival. The most common delivery techniques in human iPSCs use either chemical or physical transfection approaches. While chemical-based transfection methods are less harsh than physical approaches, they often demonstrate very low transfection efficiencies in human iPSCs. Electroporation or nucleofection are common physical transfection techniques that exhibit relatively high transfection efficiencies at the expense of reduced cell viability. Depending on the experimental goal and design, one technique may be preferred over others. For instance, the low efficiencies observed with chemical-based transfection techniques may be overcome by incorporating a selectable marker into the experimental design, enabling the removal of cells that did not incorporate the correct edit. One of the most critical factors that influence genome editing efficiency is gRNA design. Different gRNAs can exhibit varying on-target activities even when the targeting portion of the gRNA, also known as the crRNA, is designed to target the same gene [15, 16]. Thus, it is often recommended to test multiple crRNAs for a specific gene or genomic location of interest. A quick screening assay can be used to identify gRNA design(s) with highest on-target activity and assess the efficiency of genome editing events. For example, after editing human iPSCs and prior to cloning, the culture will consist of a mixed population of cells containing different edits. At this point, the mismatch cleavage assay can be used for screening. It is based on the concept that INDEL-containing DNA will anneal with wild-type DNA to form heteroduplex (‘mismatched’) structures. A structure-specific endonuclease, such as the ArciTect™ T7 Endonuclease I, cuts the mismatched structures and the relative proportion of uncut and cut fragments provides an estimate of the editing efficiency within a cell population. A major concern when editing cells using CRISPR-Cas9 are off-target effects. These arise when Cas9 cuts the DNA at sites other than the specific site you wish to target. As Cas9 relies on complementary base pairing of gRNAs and the DNA sequence, the gRNA can exhibit unintended interactions with other locations of the genome. Off-target effects can be minimized through multiple avenues, including the previously discussed area of strategic gRNA design and methods to reduce the amount of time Cas9 is present in the cell. As mentioned above, a major benefit of RNP CRISPR-Cas9 systems is the reduced chance of off-target effects. RNP-based expression systems, such as ArciTect™, allow one to control the amount and duration of Cas9 presence in the cell, since it is delivered as a purified protein. Another approach that can further reduce potential off-target effects involves using a modified version of Cas9 protein called nickase, which creates a single-strand cut . Combining nickase-gRNA pairs targeting opposite DNA strands can result in an overhanging double-strand cut. Because the probability of off-target sites with homology to both of the target sequences is reduced, this method theoretically produces fewer off-target mutational events. Several groups have also engineered ‘high-fidelity’, ‘enhanced specificity’ or ‘hyper-accurate’ Cas9 variants that harbor point mutations to impact how Cas9 interacts with DNA [24—27]. Finally, optimization of conditions such as cell density, transfection parameters or Cas9:gRNA ratio can help achieve the highest possible editing efficiency while reducing off-target activity. For example, off-target effects are sensitive to the amount of gRNA used and the Cas9:gRNA ratio . Despite measures to lower the chance of off-target effects, a successful genome editing experiment in human iPSCs should also demonstrate specificity—that only the desired mutation is present. DNA sequencing around the site of interest can be used to verify the specificity of the genome editing experiment. Since most gRNA design programs also predict potential off-target sites for a given gRNA, sequencing of predicted off-target sites is the most accessible method to identify the presence of off-target edits. Sequencing can be accomplished using traditional Sanger sequencing methods or targeted next-generation sequencing (NGS), yet the latter can be cost-prohibitive. Studies have shown that sequence homology alone is not an adequate basis for predicting off-target sites . The best currently available methods to assess specificity rely on unbiased genome-wide sequencing, which enables simultaneous validation of clonogenicity, presence of the target edit and absence of off-target mutations. Several assays, such as GUIDE-seq (genome-wide unbiased identification of double-stranded breaks enabled by sequencing) , HTGTS (high-throughput, genome-wide, translocation sequencing)  and BLESS (direct in situ breaks labeling, enrichment on streptavidin, and next-generation sequencing)  can be used to detect Cas9-induced DNA breaks in live or fixed cells. While bioinformatically challenging and cost-prohibitive, these comprehensive, genome-wide methods are becoming standard practice to detect off-target activity. Read more about strategies for screening and verification in genome editing experiments in this evaluation of genome editing technical bulletin. A major hurdle for genome editing of human iPSCs is the extremely low cloning efficiency of these cells (typically <5% ), making the generation of clonal cell lines an inefficient process. During clonal derivation, iPSCs must overcome a number of bottleneck events . Firstly, iPSCs commonly exhibit low survival immediately following single-cell plating. Secondly, cells that do survive may lose proliferative capacity and fail to re-enter the cell cycle. Thirdly, daughter cells may die after cell division, preventing colony growth. It is therefore important to optimize culture conditions for clonal survival and propagation to increase the success rate of a given genome editing experiment. CloneR™ is a culture supplement that supports single-cell survivability to enable efficient generation of iPSC clones . The addition of this supplement to human iPSC culture media, such as mTeSR™1, the medium used most widely in human iPSC genome editing publications, removes the need for single-cell adaptation. This is an important consideration, as long-term single-cell passaging can lead to genomic instability and the acquisition of karyotypic abnormalities in human iPSC cultures . These abnormalities can alter the behavior of stem cells, potentially jeopardizing the validity of a disease model and often provide a selective advantage to human iPSCs through enhanced cell proliferation and survival or reduced differentiation capacity . To help monitor these recurrent abnormalities, we developed a qPCR-based assay (hPSC Genetic Analysis Kit) to detect over 70% of the most common karyotypic abnormalities reported in human iPSC cultures. This rapid and cost-effective kit enables researchers to pre-screen lines for the absence of karyotypic abnormalities prior to unbiased analyses such as Giemsa band (G-banding) karyotyping, which can take several weeks and is exponentially more expensive. Beyond the selective pressure that lies in long-term single-cell passaging and/or cloning of human iPSCs, the mechanism of CRISPR-Cas9 genome editing in iPSCs poses a significant risk to the genomic stability of the cell. Successful genome editing relies on generation of a DNA break that, in human PSCs, often triggers rapid cell death or apoptosis. During development, this process works to enhance the overall fitness of the organism by preventing abnormal cells from contributing to the embryo . However, during genome editing this represents a significant hurdle to overcome. In response to DNA damage, the tumor suppressor protein p53 becomes activated and triggers apoptosis or cell cycle arrest. The same process occurs in response to Cas9-induced DNA breaks and therefore, cells with an impaired p53-dependent DNA damage response will fail to undergo apoptosis and will be selected for during CRISPR-Cas9 genome editing [36, 37]. While P53 is a central regulator of apoptosis, there are other factors in the apoptotic pathway that can also act to limit human iPSC survival post-editing. For instance, Li et al. (2018) demonstrated that overexpression of the anti-apoptotic protein BCL-XL can greatly enhance editing efficiency . Interestingly, amplification of chromosome 20q11.21 is a sub-karyotypic recurrent abnormality that results in increased copy number of several genes, including BCL-XL, and confers a strong selective growth advantage to human pluripotent stem cells (hPSCs) [39, 40]. Chromosome 20q11.21 gain is often undetected by traditional karyotyping methods, such as G-banding, but can be detected using the hPSC Genetic Analysis Kit. Although mutations that enhance cell survival, such as p53 loss-of-function or BCL-XL amplification, help enhance editing efficiency, they pose significant risks for data interpretation and clinical application, highlighting the need to regularly monitor human iPSC karyotypic stability. At STEMCELL (BC, Canada), we recently used the ArciTect™ CRISPR-Cas9 system to generate hPSC clones harboring a C-terminus truncation of CDK5 regulatory subunit-associated protein 2 (CDK5RAP2). This gene has been associated with the development of primary microcephaly [41, 42]. In our study, we successfully generated stable isogenic human iPSC clones harboring CDK5RAP2 heterozygous and compound heterozygous loss-of-function mutations. Comprehensive characterization demonstrated that the clones retained critical human iPSC quality attributes, including robust morphology, pluripotency, undifferentiated state marker expression and genomic stability. STEMdiff™ Cerebral Organoid Kit. These results demonstrate the powerful disease modeling strategies that are now possible and will undoubtedly help uncover mechanisms of disease pathogenesis. The growing number of successful CRISPR-Cas9 experiments in iPSCs are leading to new disease models, demonstrating the versatility of these technologies in revolutionizing disease research. As the technology matures, a refined toolkit, such as the ArciTect™ CRISPR-Cas9 System, enables researchers to perform genome editing by providing a system with customized synthetic gRNAs, variations of Cas9 protein and reduced off-target effects. The combined workflow including iPSC genome editing, quality characterization, and downstream differentiation protocols provides useful tools to further our understanding of how individual genes and/or genetic variants impact biology and disease pathogenesis, driving the transition from bench to bedside. 6. Grilo LS, Carrupt PA and Abriel H. Stereoselective inhibition of the hERG1 potassium channel. Front. Pharmacol. 1:137 eCollection (2010). 25. Slaymaker IM, Gao L, Zetsche B et al. Rationally engineered Cas9 nucleases with improved specificity. Science. 351(6268), 84–88 (2016). Scientists Helping Scientists STEMCELL specializes in developing cell culture media to support basic and translational research which uses pluripotent stem cells and mesenchymal stem cells. In addition to our original line of haematology products, we also offer primary cells and a comprehensive suite of immune cell isolation tools and instruments. Additionally, STEMCELL’s Contract Assay Services department supports researchers by developing tailor-made in vitro assays. Finally, based on our stem cell research expertise, we have grown our product portfolio to include disease modelling tools, media and kits to grow organoids and perform tissue specific differentiation.